Gazing up at the monuments of the ancient lost city of Petra – feet sinking into soft red sand and dust swirling about – you can’t help but be amazed by the genius of its ancient Nabatean builders. 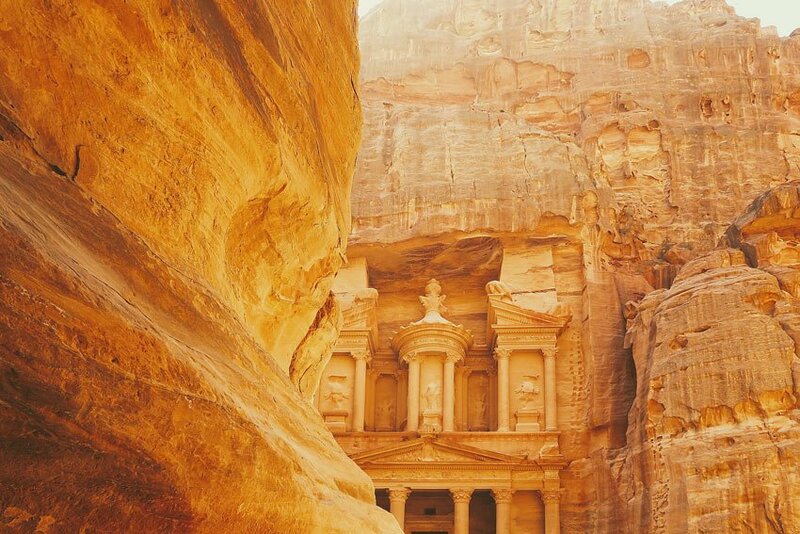 Wealthy traders and masterful rock sculptors, they chiseled a vast city of beautifully carved tombs, temples and houses out of rose-and-peach rock in the Jordanian desert. The Nabateans started building Petra around the 5th century B.C. They likely chose the site for easy defence. Its wondrous entrance way – the Siq – is its only access. 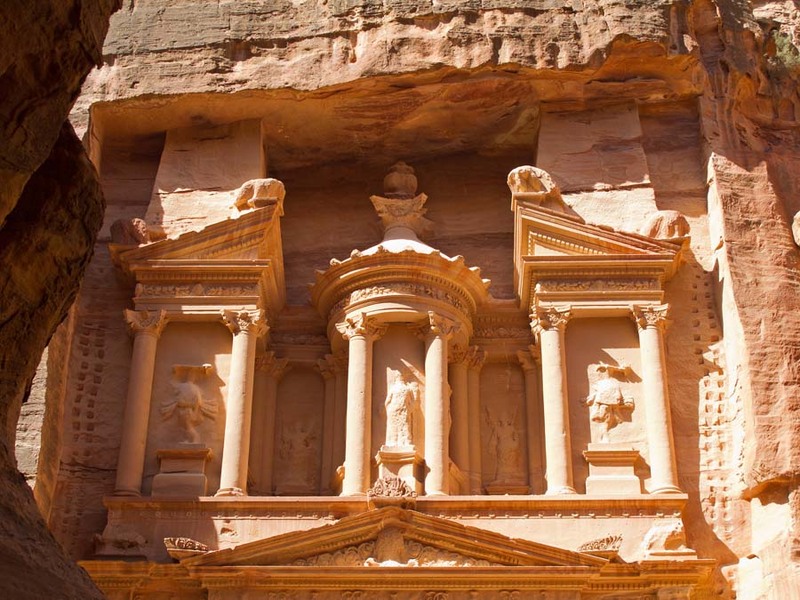 For ancient Petra stood at the crossroads of ancient trade routes linking East and West. Caravans of camels loaded with spices, incense, silks and gold were taxed by the Nabateans for safe entry through the Siq. 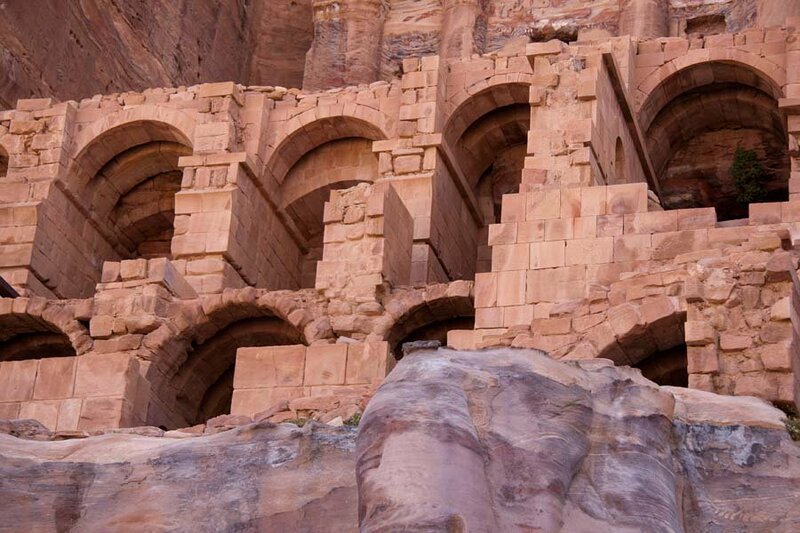 A center for trade and culture, Petra at its height was a glory of the ancient world. Over time, however, its glory began to fade and it was eventually abandoned 800 years after being founded. 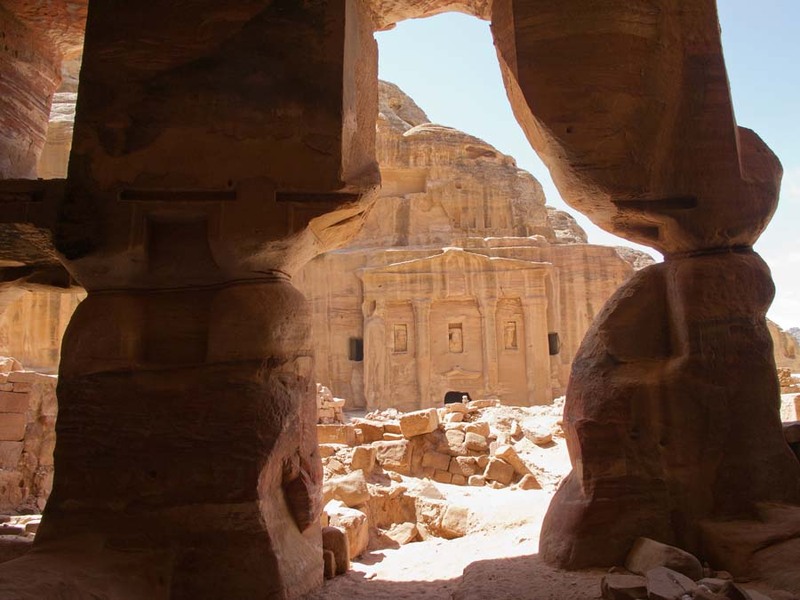 Many of the tombs were looted and, for centuries, Petra was “lost” to the modern world. 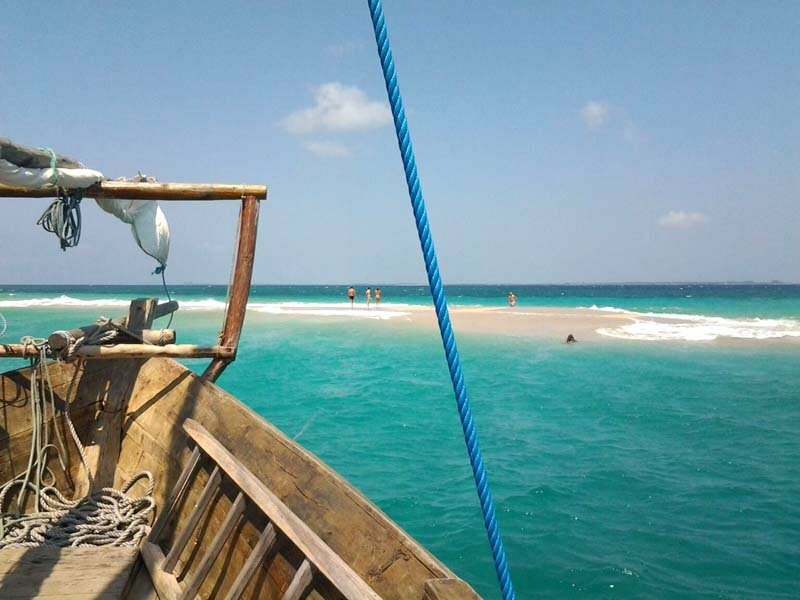 Lost, that is, until a Swiss explorer named Johannes Burckhardt re-discovered it in 1812. 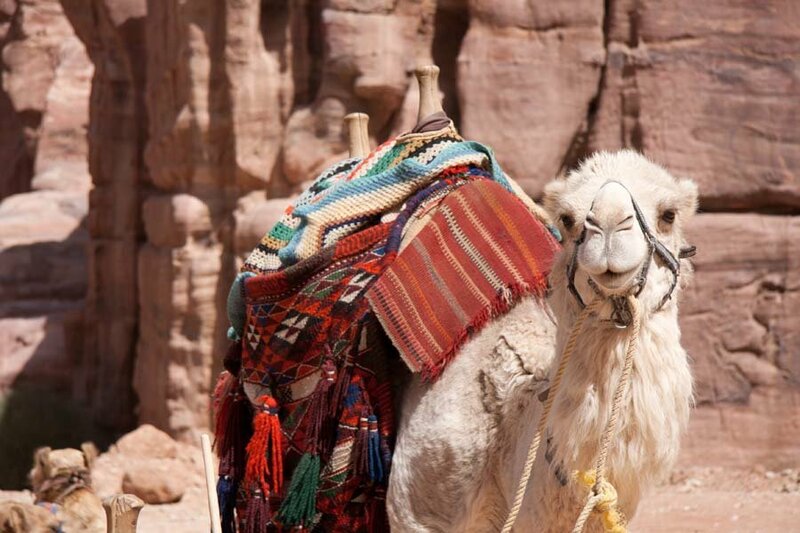 The story goes that, dressed as an Arab, he persuaded his Bedouin guide to lead him to the lost city. 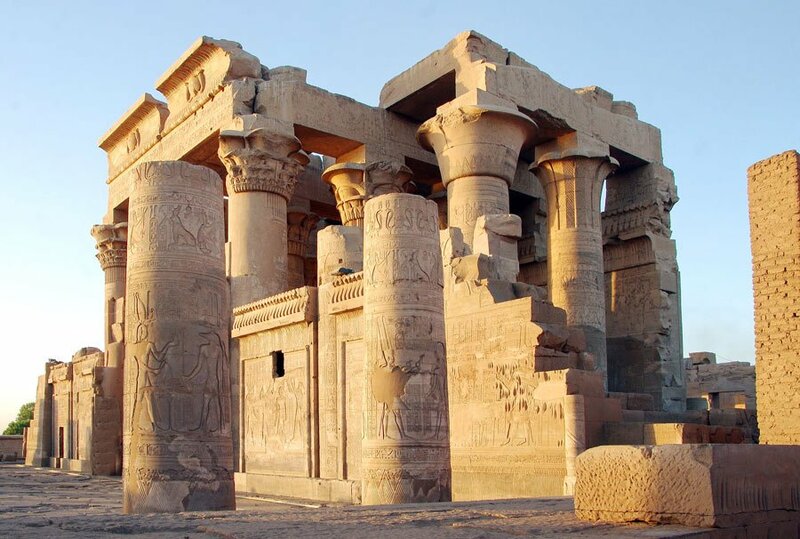 It has more than 800 registered archeological sites, including 500 tombs. 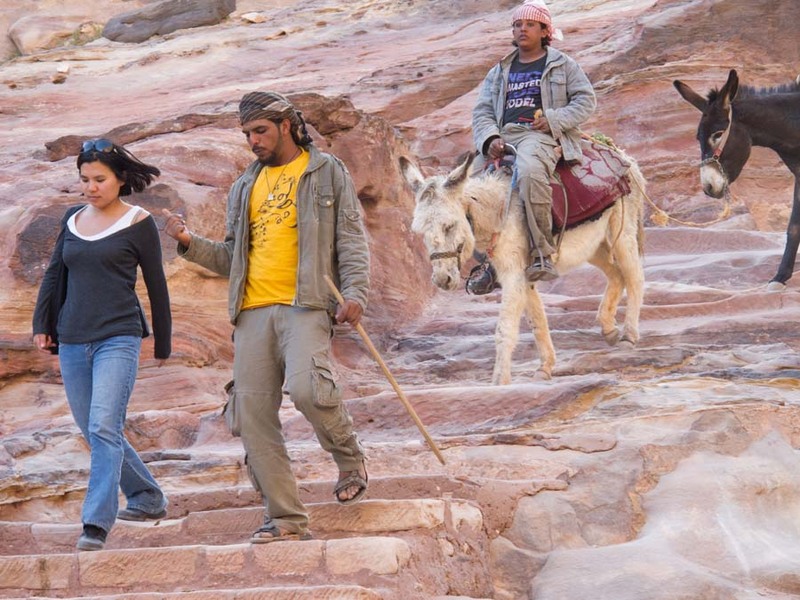 To reach the Petra ruins, a horse carries you along a stony track to the entrance of the fabled Siq, a 3/4-mile path snaking through a narrow mountain canyon. 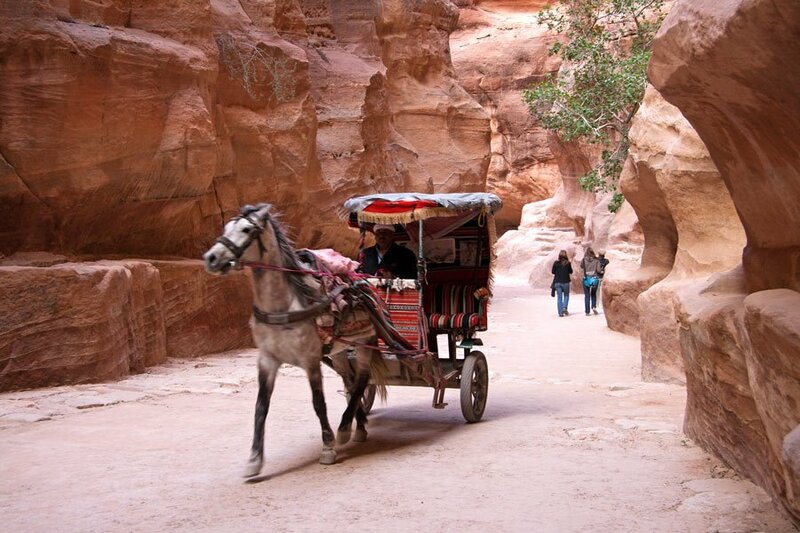 At the entrance, you can ride in a horse-drawn carriage – or walk – through the Siq. Sandstone cliffs soar more than 260 feet high on either side as you make your way along the Siq’s twisting turns. It’s quite dramatic to follow this path – sometimes it squeezes tight to only seven feet in width. Stone idols line the rock walls, and guides point out the clay pipes that fed water into the city. The limestone slabs beneath your feet or carriage wheels date back to Roman times. 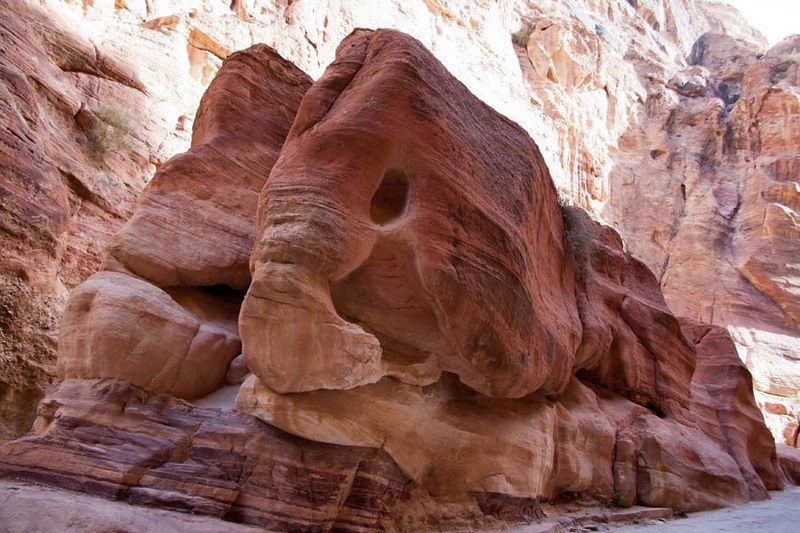 Don’t you think these giant rock formations lining the Siq look like elephants? Suddenly a magnificent rock carving – the Treasury (or Al-Khazneh) comes into view. You can’t help but gasp when you see this colossal 140-foot high monument. Sunlight illuminates the façade’s double row of 12 Corinthian columns, crowned by a giant stone urn. Hundreds of royal tombs, sacred halls, mammoth temples, cave houses and even an ampitheater sprawl before you in a desert valley. Petra’s grandest edifice, the Monastery, is some distance away from the Treasury – and a breath-sucking climb up 850 granite steps (or you can ride a donkey up). At least you can get a refreshing cup of tea from a simple Bedouin tea shack up top. 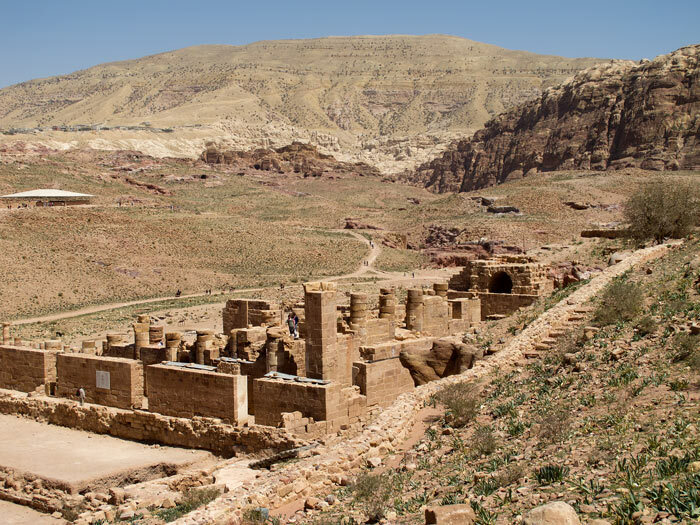 Interestingly, researchers have discovered the Nabateans sculpted their monuments to capture key celestial events and sunlight images, such as the lion’s head (a sacred animal) reflected by the setting sun at the Monastery. 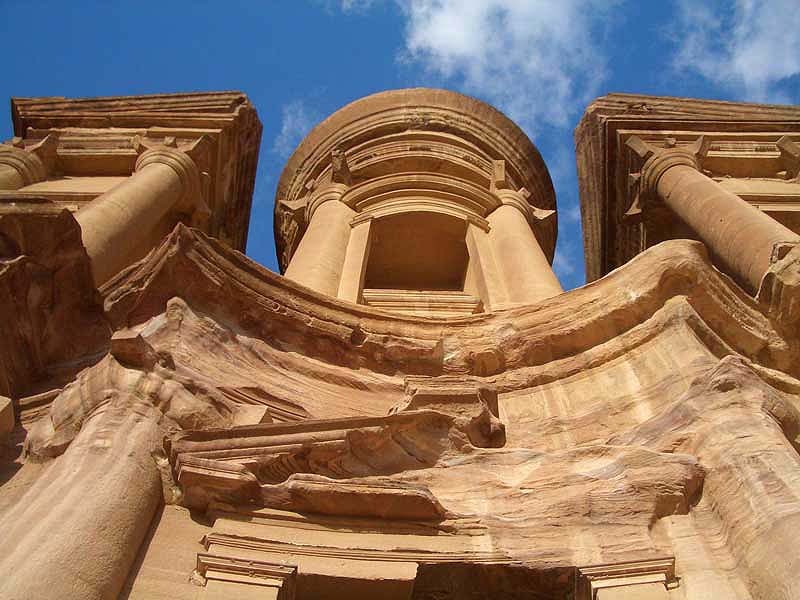 Petra thrived for centuries, only fading away away in the 4th century A.D. when the Nabateans left – perhaps earthquakes or shifting trade routes led to its decline. Window to the ancient world? After Burckhardt re-discovered Petra, the English theological scholar John William Burgon penned a poem in 1845 about Petra. 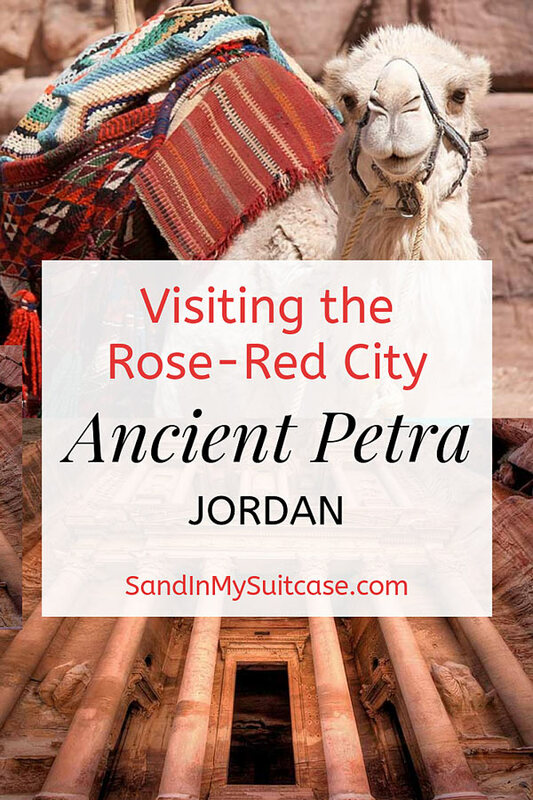 Even though he never actually visited the city, he famously called it “a rose-red city half as old as time.” The name stuck, and the city is known today as the rose-red city of Petra. So far, perhaps only 15% of the city has been unearthed. Who knows what other secrets this ancient kingdom may yet reveal? If you stay overnight (which we highly recommend), you may want to return to the Petra archaeological site when it’s dark. 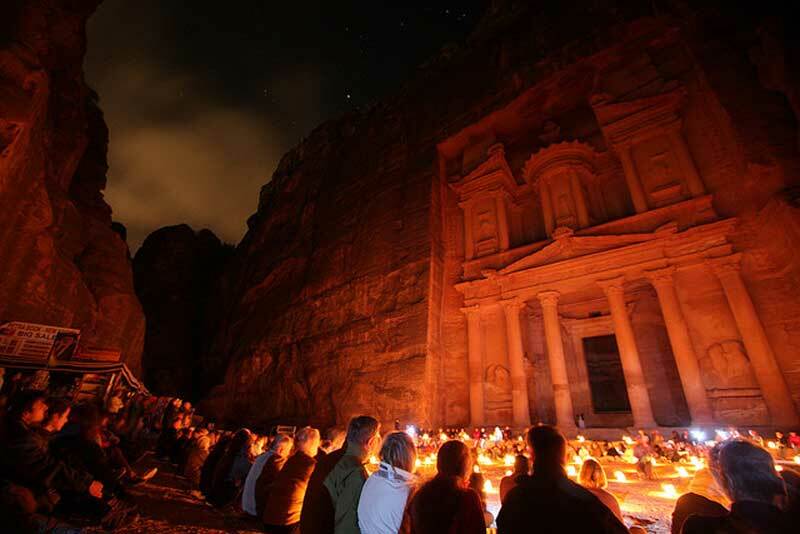 Visiting Petra by night is a totally different experience. That’s when the Siq is hand-lit by 1,500 candles; you slowly walk along the Siq to the Treasury. No large tourist groups. No horse-drawn carriages passing you by. Expect to be completely awed by the silence and the experience of treading the centuries-worn path by candlelight. At the Treasury, you sit on rugs and listen to a musician play an ancient flute-like instrument and a Bedouin guide share a story about Petra. 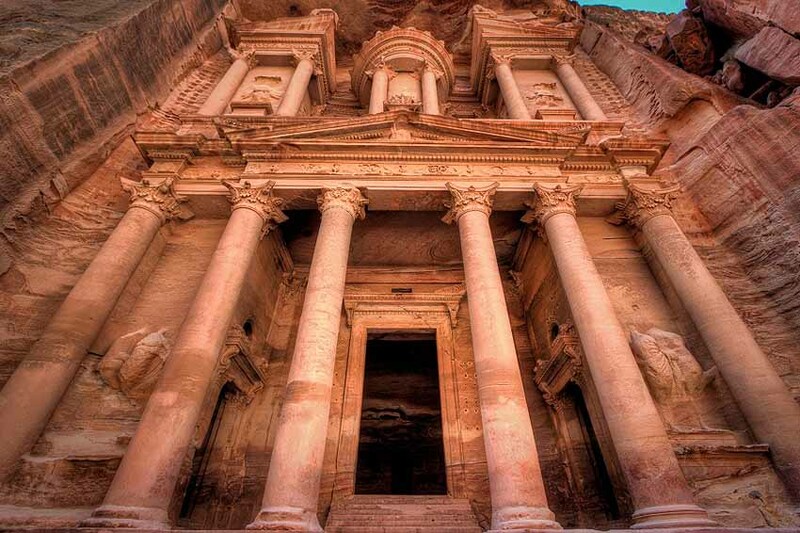 Petra is the best of Jordan’s tourist attractions. 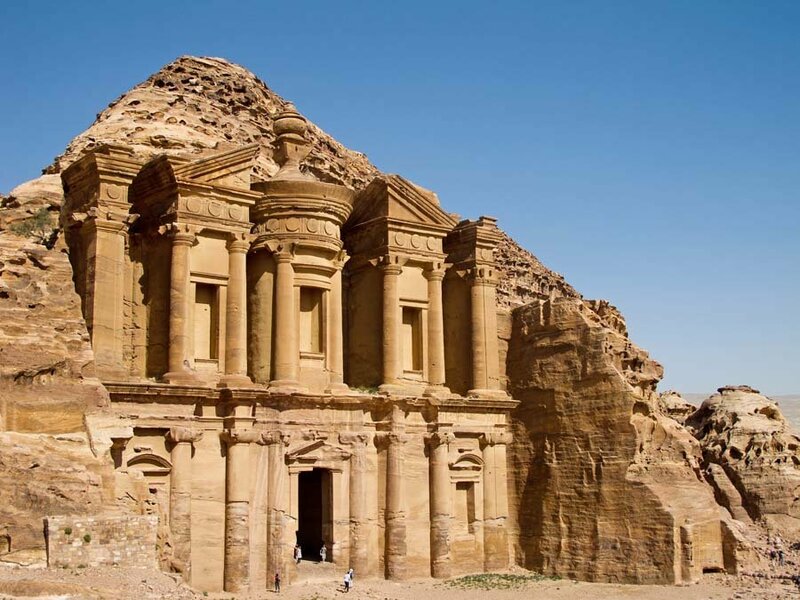 Many travelers visit Jordan and Petra Archaeologic Park on package tours. 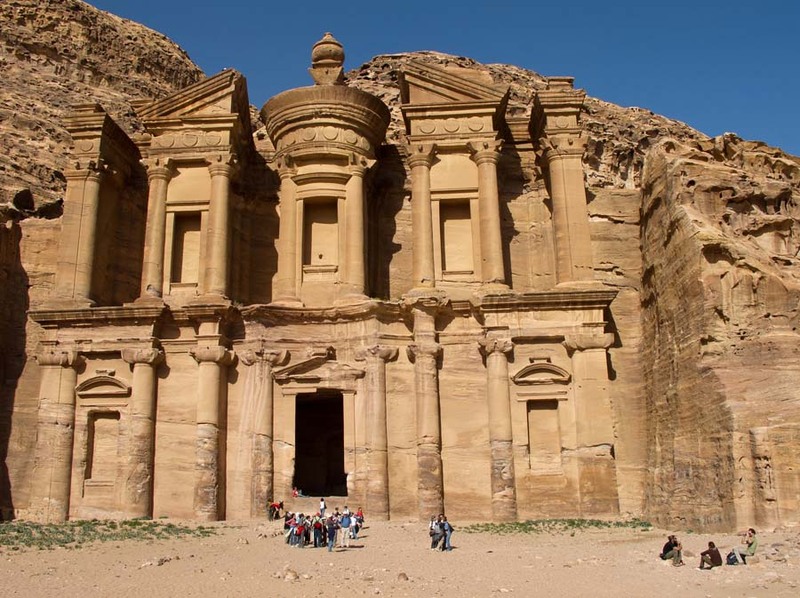 Cruises to the Middle East often offer shore excursions to Petra too. If traveling independently, hire a licensed tour guide to make the most of your visit (book at the Petra Visitor Centre). 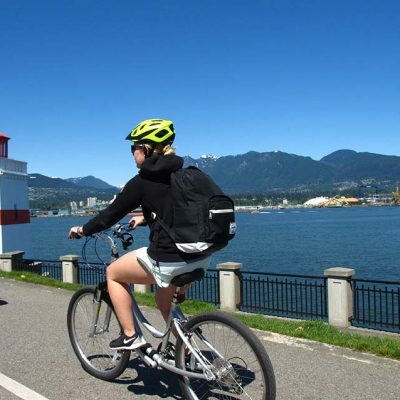 Ideally, allow two days to take in the whole 65-acre site. Two-day entrance fees are 55 J.D. (about $78 USD) and include a horseback ride to the beginning of the Siq (extra cost for a horse-drawn carriage ride to the Treasury monument). A one-day entrance fee is 50 J.D. (about $70 USD). The 2-hour “Petra by Night” 2-hour show is offered on Monday, Wednesday and Thursday nights, starting at 8:30 pm. Tickets for this cost extra: 17 JD (about $24 USD). 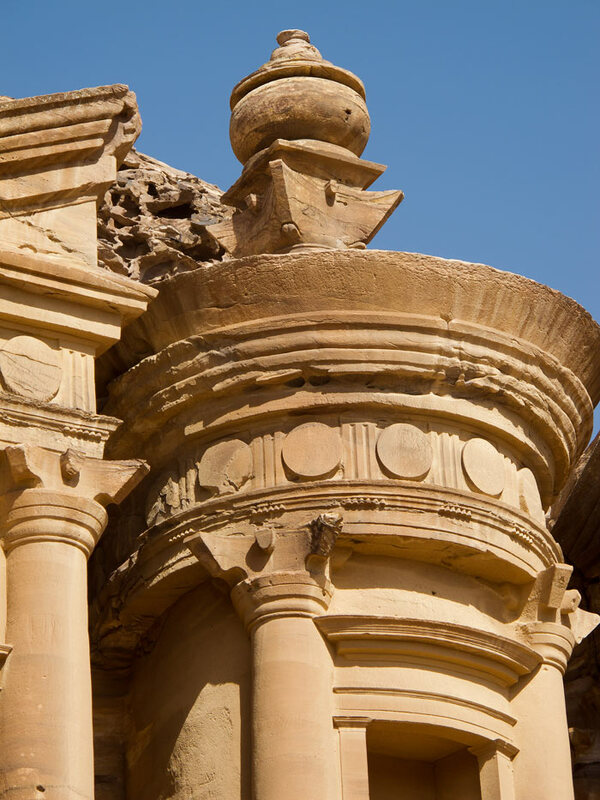 For more Petra facts and information, see the Visit Petra website. We stayed at the 5 star Movenpick Resort Petra. It’s the closest hotel to Petra, located directly at the site’s entrance, and has 183 newly renovated rooms and an outdoor pool. Spring (March to May) and autumn (September to November) are the best times to visit, when days are pleasantly warm. Avoid the scorching heat of summer. Is it safe to visit Petra? 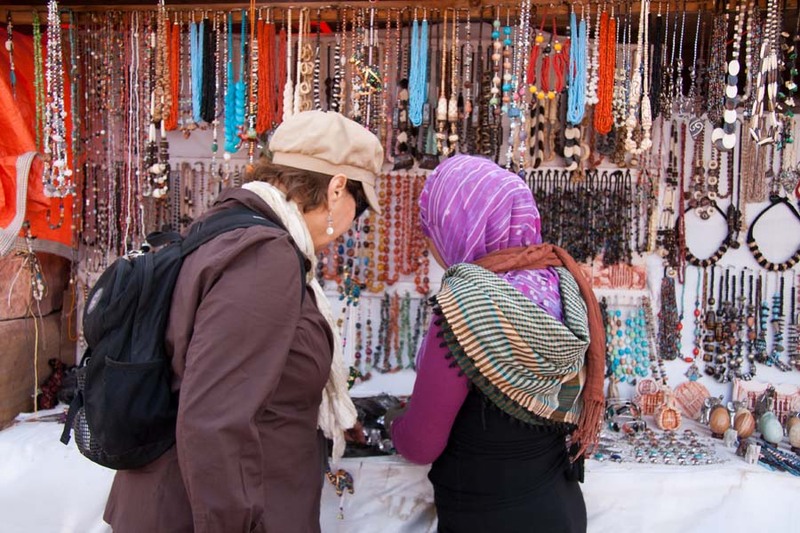 Jordan is generally considered safe to visit (but check government travel advisories before you go). You shouldn’t get sick if you drink only bottled water and eat at recommended places. As Petra is sandy, wear comfortable closed-toe walking shoes (not travel sandals) and carry bottled water, a hat and sunscreen. If you like this post, then pin it! Have you visited Petra? What was the most awe-inspiring sight for you? Craving more exotic travel inspiration? The giant rock formations really do look like elephants! I really enjoyed reading your post; it really felt like I was right there next to you as you traveled through the ancient city of Petra. Great tips at the end about when to go and where to stay– this will definitely come in handy for anybody considering a trip to Petra. Wow.. fabulous post. makes me want to go there ASAP. Your photographs capture the place so beautifully. Wonderful post with amazing photos! I’ve always wanted to visit Petra since I was a boy and saw ‘Indiana Jones and the Last Crusade.’ I always thought it would be cool to kinda live my life in a similar form…without the gun battles ;) Someday I’ll get to Petra but in the meantime your photos took me there in spirit! I had low expectations for Petra (not one for much hype), but like my visit to the Grand Canyon, Petra surprised by an overabundant excess. Your chronicles make me crave more; beautifully written. 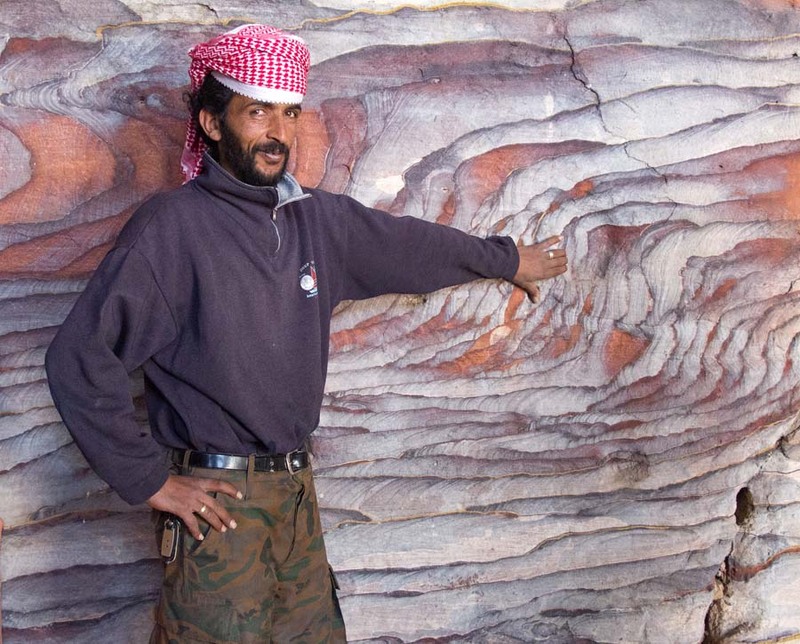 Great photos and yes the rock formations do look like elephants. I thought that exactly, even before reading the photo’s title. Great photos! I’d recommend to walk down the Siq; you can ride or take a carriage back (because you’ll be shattered after a long day’s exploring! :D). And, if you buy those lovely little bottles of different coloured sand, be sure to pack it securely, or you really will have ‘sand in your suitcase’! There is no way I could manage 850 stairs with my knees! And the donkey ride doesn’t thrill me either. We did that in Greece and there was no rail or anything to break one’s fall down the cliff if the donkey lost his footing. And in that blazing heat … Anything is possible! But that aside, Petra does indeed look like a fascinating place. Thx for sharing your experience with us. We were invited to visit one of my husband’s colleagues in Jerusalem in March, but something tells me that might not be happening. I had already decided that a visit to Petra should be part of the same trip, and your post has certainly solidified that decision. Israel and Jordan make a good combo – that’s in fact how we did our trip :-). Petra is truly a breath-taking sight. Those poor donkeys! I walked in, but had the exhilarating experience of riding out fast in a horse-pulled chariot. Amazing. Your article on Petra is one of the best, and most useful for anyone planning a visit, that I have ever read! And your photos really capture everything so well. Excellent, excellent post! Greetings from South America instead. These photos all take my breath away. I would only dare travel to Petra with a group (my husband wouldn’t go). Thank you for the travel tips because I would love to see this beautiful area. I love your pictures, they are beautiful. The camel looks pretty friendly too. Hard to grasp they really started building Petra so many centuries ago, fantastic. I am enthralled with your magnificent photos, but your excellent background information told just as important a story. Thanks for an excellent post. 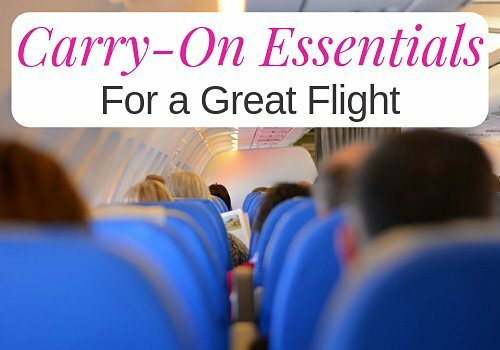 I really enjoyed your post and photographs and thanks for the helpful tips at the end. My sister has bad asthma so she was very happy to hear about the donkey option for getting to the monastery! 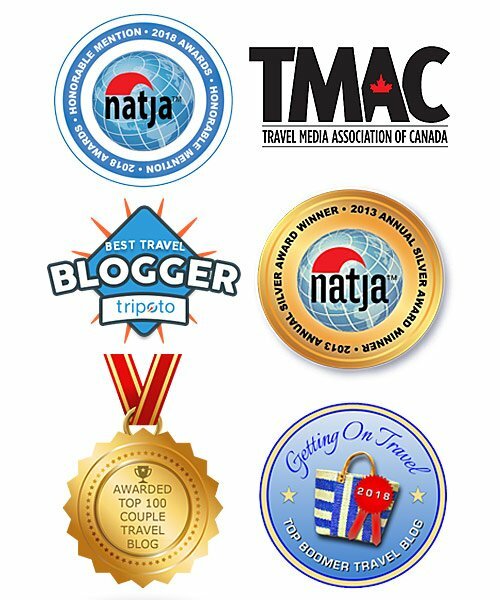 We’ve been wanting to go to Petra for years; maybe your post will nudge us along! An amazing place. To think that so much detail on the architecture remains after all these centuries and that only 60% of Petra has been unearthed. I would love the opportunity to see this. Wonderful post and excellent photos. Petra has been on my bucket list for many years. I hope to get there one day…..especially after reading this. Awesome info and great photos! Jordan is in my “see you soon” list. Hope to get there early 2015 so this is so helpful! Gorgeous photos. We’ve never travelled in the Middle East and might never – but if there is one site I’d like to see it’s Petra. Especially love the shot looking up up up at the entrance! 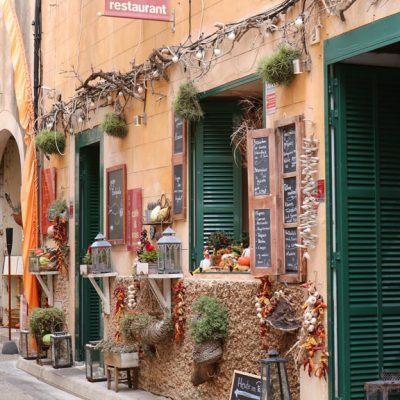 Thanks for the tips–this is definitely on my list of places I’d like to visit! Glad to hear you had a positive experience. Amazing shots! This brings me back to the classic Indiana Jones movie. 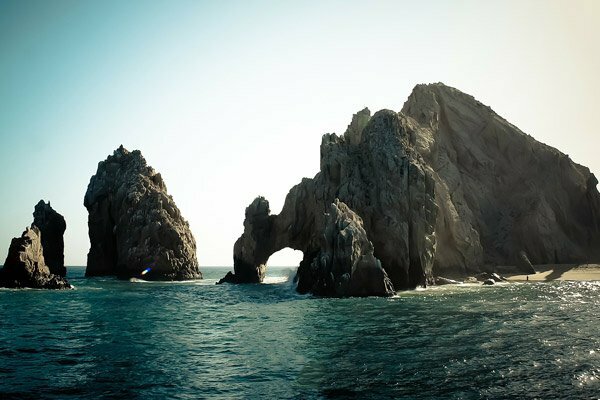 Seeing the images is a throwback, and I can only imagine how it felt to see this in person….although your images did a fine job relaying the feeling. Excellent photos, Janice! Totally agree with you that visiting in the summer months would be a horrible idea. My wife and I visited in March 2009 and even found that the weather then was borderline too hot, especially as soon as you get into the wide open area past the treasury—there’s literally no shade on the trails! Definitely gotta wear a hat and hydrate, hydrate, hydrate; sun stroke is all-too real of a possibility over there. Thanks for sharing, Janice! Your photos are amazing!!! I confess the Middle East has not been high on my list of places to visit, but I have become more intrigued as of late. I think my family would throw a fit given the safety issues for much of that region though. But, as you say, Jordan is pretty safe. This would be an incredible site to experience in person. 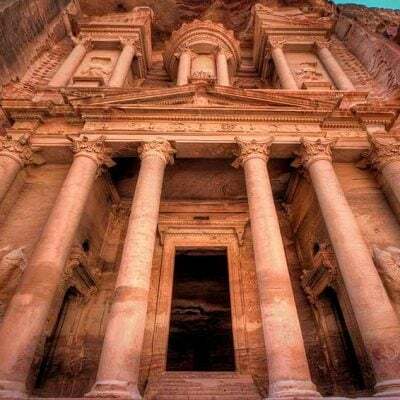 I’ve long wanted to travel to Jordan to see Petra and your photos and description of Nabatean history has inspired me to make it sooner rather than later. 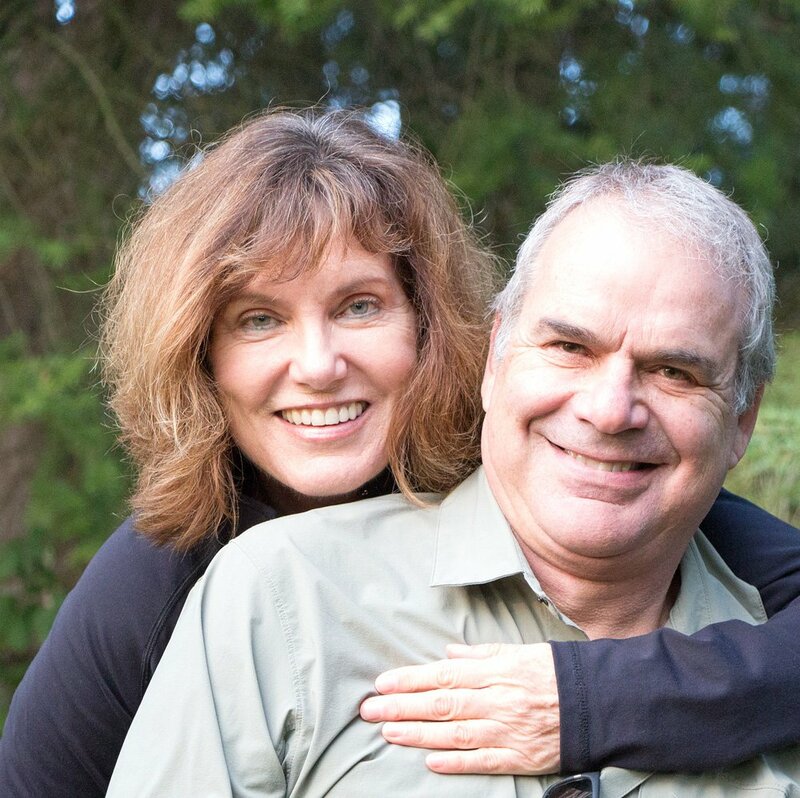 Thanks for the beautiful photography and a glimpse into what sounds like a fantastic journey!